While Robert Schumann played the cello both as a child and as a young man, he wrote very little original music for the instrument: only his cello concerto and the Five Pieces in Folk-style, op.102, offered in this album. But cellists, eager to play his wonderful chamber compositions originally written for other instruments, have made successful and alluring transcriptions of them; six of those are offered on this album. 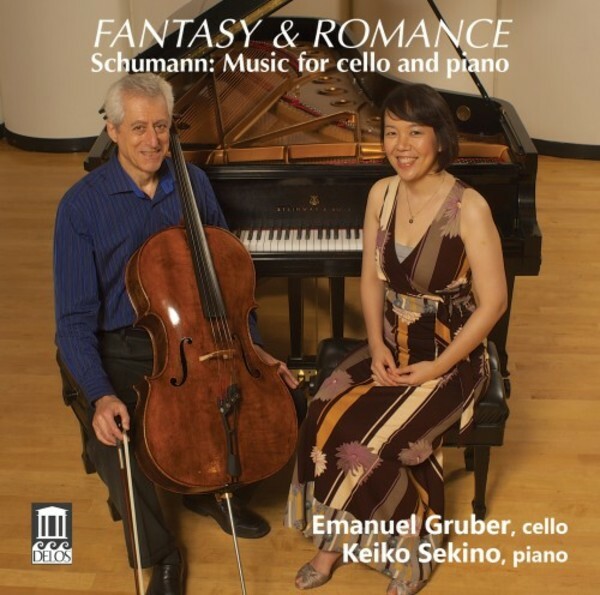 In this, Emanuel Gruber�s second album for Delos, we hear � in addition to the op.102 pieces above � cello versions of the Fantasy Pieces, op.73; Adagio and Allegro, op.70; Three Romances, op.94; Evening Song, op.o85; and Tra�merei, op.15. All of these marvellous works reflect Schumann�s wondrous lyricism and heartfelt passion; also his hallmark spontaneity and dizzying mood swings. Joining Emanuel is the distinguished pianist Keiko Sekino: an ideal musical partner; together they achieve stirring and deeply emotional interpretations that will touch listeners� hearts and draw them irresistibly into Schumann�s unique and ultra-romantic musical world.